album, Janis Joplin implored the almighty to buy her a Mercedes Benz. In her earlier years, she might have prayed for art supplies instead. In her youth in Port Arthur, Texas, "She would get jobs around town to get canvas and oil paints," says Laura Joplin, the younger sister of the '60s rock icon who administers the estate with her brother Michael. "At one point, the story goes, she was singing a earn a little bit of money to buy canvas and paint." artwork. "The Art of Janis Joplin," now touring galleries, showcases selected Joplin works as well as classic posters from her musical career and a number of paintings of Janis done by her San Francisco rock scene soul sister, Grace Slick. It has already hit San Francisco (where Joplin came to fame), Los Angeles (where she died), and Austin, Texas (where she first sang in public). To help celebrate Janis's 63rd birthday during the Austin run, sister Laura hosted public events at the Art on 5th gallery and gave Rhino a personal tour of the exhibit. 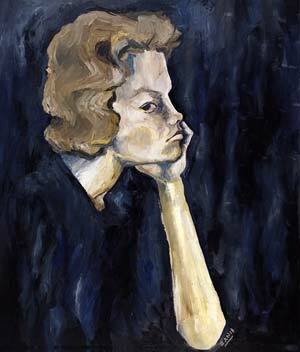 Anyone who might wonder about the singer's validity as a visual artist will be struck if not impressed by Joplin's oil paintings in which her sister rightly detects the influence of the Italian cubist Modigliani. One, which depicts Christ on the cross, shows the considerable technique and bold strokes of a potentially serious artist. Two self-portraits in oil once hung in the Joplin family home. "One was in our dining room for a long time," says Joplin. "It disappeared one day because she came and took it over to [her friend] Jim Langdon's and gave it to him for his birthday, much to our frustration. We were on her case about that—how dare you? And consequently, she said, okay, okay, and painted this other one to go in its place." The collection includes charcoal works from Janis's sketchbooks, sketches from her letters, and even colored pencil works she did of characters from the Oz books during a summer job at the Port Arthur library. 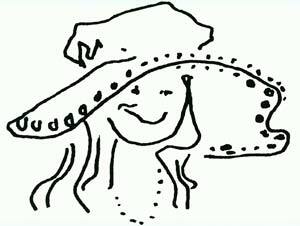 One of the most iconic images is a simple self-portrait of Janis in a floppy hippie hat. "She was showing us that she had just made this hat, and this is what it looked like. Janis was known for being someone who could give you powerful emotions in a song, and to me she had the same quality here," notes her sister. "You get a feel for who she was and how she felt about that hat in just a few strokes. And to me, that's what the technique of being an artist is all about." Joplin says that all the arts were a big part of her childhood household. "Janis was always creatively oriented, and there was a lot of stimulation to support that. Our mother had books from all the great museums around the world, and our father was always taking us to the library every week. And Janis read about artists, checked out books about painting, and took lessons to learn to draw. And she spent a high percentage of her time practicing. She was a very dedicated person, just as she was about her music. 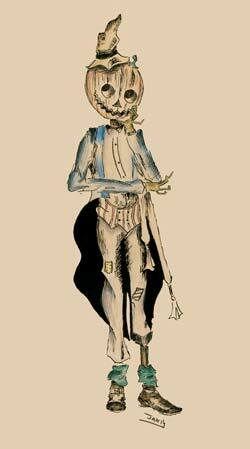 She studied it, and she had sketchbooks and sketchbooks of things around," she recalls. Art and fashion design were early ambitions for Janis until music became her main focus. "She went on her own kind of personal walkabout of the beatnik art scene of the United States, exploring and looking to see what was there, who she was, and how she rated and stuff," Laura explains. "And I really think that music ultimately attracted her because, unlike art, it has such an immediate impact." Janis studied art in college in the years before she finally headed out to San Francisco to join Big Brother & The Holding Company as the band's lead singer. Laura feels that music didn't sidetrack Janis from continuing to create art as much as the involvement with drugs. "Her own interpretation later was that she got distracted by her experimentations with drugs, and they got in the way." The work now being shown was collected from a number of sources. "We knew it existed and had a few pieces. We knew Jim Langdon had a piece. An her letters had sketches, which have been turned into beautiful works of art," says Laura, who feels "there's bound to be other pieces around somewhere." And perhaps the show will bring them to light, just as Laura's 1992 book of her sister's letters, Love, Janis, uncovered other correspondence. "Shortly thereafter, I had people give me three batches of letters," she notes. "I learned lots of stuff from them. I prefer it when she can tell her own story in the letters and through her art." The famed singer's works had been reproduced in limited editions of serigraphs and computer-printed giclees that are numbered and signed by Michael Joplin (himself a glass-blowing artisan), and come with certificates of authenticity from the Joplin estate. They are available for purchase at the exhibitions and through the company that put together the exhibit, Area Arts (www.areaarts.com). wonderful people. And I've gotten to explore the family sister, gotten to know my own sister, and resolve a lot of my own issues about grief and death," she concludes. "I got to go to the Grammys. Wow! I did Janis's induction into the Rock and Roll Hall of Fame. And to learn about her place in the heart of so many people has been just so awesome."